Dressed in a traditional fur trimmed red coat with toggle buttons and pockets filled with candy this dear Santa represents Christmas of yesteryear when clear toy candy and a doll or a drum were special gifts for the little ones. 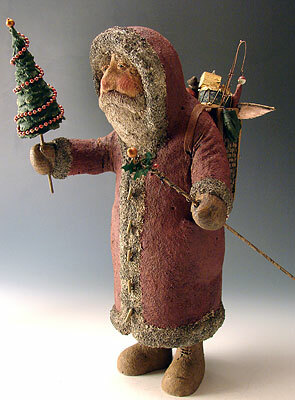 Hand carved entirely from American chestnut this Old World Santa is holding a small evergreen tree decorated with a string of red beads in one hand and a walking stick trimmed with holly in the other. There is so much intricate detail in the goodies stuffed in the woven basket on his back. A fishing rod, bow and arrows, fruit and a drum, a sail boat and kite all done in miniature and there's so much more! Copper wire and mesh were used in making some of the toys and candy, also the walking stick and string of beads on the tree. Truly a delightful carving for Santa collectors!